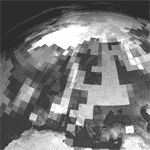 Media analytics and visualization on climate change coverage. Decision support initiative to help citizens and communities. 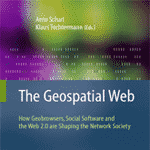 Geobrowsers, Social Software, Web 2.0 - How they shape the network society. Edited Springer book on new media and sustainability. Research Project to strengthen relations among stakeholders. 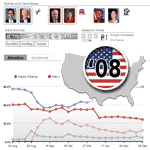 Trends in media coverage before and after the 2008 election. The Research Network for Environmental Online Communication (ECOresearch) presents and promotes interactive technologies for bringing together stakeholders of different disciplines and geographic regions to explore the design, implementation and evaluation of new media applications that advocate sustainability and the protection of natural ecosystems. Technology showcases such as the Media Watch on Climate Change, the Climate Resilience Toolkit and the Climate Challenge build upon the webLyzard media monitoring and Web intelligence platform, which is continually being extended and refined through research projects on natural language processing, information extraction, visual analytics and semantic technologies. As part of the DecarboNet research project and ongoing collaboration between international partner organizations, the Media Watch on Climate Change has been transformed from a news and social media aggregator into a collective awareness platform including advanced support of real-time collaboration among citizens and environmental stakeholders. It also serves as a knowledge repository for the Climate Challenge, a social media competition in the tradition of games with a purpose. The collective awareness platform was outlined in a recent IEEE Internet Computing article and presented by Prof. Arno Scharl at the 46th Hawaii International Conference on Systems Sciences, and at an expert workshop co-hosted by the United Nations Environment Program (UNEP) and the International Union for Conservation of Nature (IUCN) in Switzerland. The Slideshare presentation outlines how to extract and visualize environmental knowledge from online sources, and how semantic technologies can contribute to integrated monitoring solutions and the identification of emerging issues. The ECOresearch Network explores new media applications that support social innovation and advocate sustainability and the protection of natural ecosystems.